Thanks to the Harpeth River Watershed Association and Metro Public Works who together cleaned up over 10 tons of flood debris from the common area of Boone Trace subdivision. The debris floated to the area last May. Some came from the flooded homes in the neighborhood; some debris traveled from far away. We carted off tires, fencing, decking, railroad ties, trash cans, basketball goals, a gas grill, a computer monitor, cases of soda and beer, even someone’s bagged recyclables. This morning, I ran through the Boone Trace, Lexington Point and Riverwalk neighborhoods. 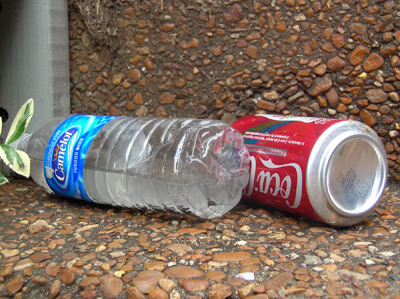 In Riverwalk, I picked up a half full Coca-Cola can and a Camelot water bottle off the roadside. I ran home with one in each hand. I do this a lot when I walk or run through the neighborhoods. And I do this daily. I poured out the Coca-Cola immediately, but kept the water and poured it on my compost pile. Both the can and plastic bottle have gone into my recycling bin. Construction workers in Riverwalk leave behind a lot of trash, but these items were nowhere around any construction area. I think residents dropped them. Why do people litter? Especially in their own neighborhood? This summer, during my evening walks or morning runs, I picked up plastic bottles, aluminum cans or glass bottles that I found on the streets in the subdivisions of Boone Trace, Lexington Point and Riverwalk. While I have no proof, I think most of these were left behind by homeowners and their children playing outside. One day, I picked up about nine plastic bottles on the soccer field in Lexington Point. Teens gathered there eyed me suspiciously. There was an empty trash can on the field next to the swing set. 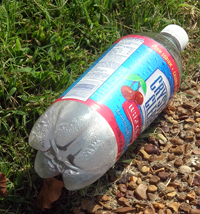 I photographed the plastic bottle above in front of a Boone Trace resident’s home yesterday. When I run in the mornings, and now that school has started, I find lots of plastic bottles left where the children catch the bus. I hope I’m noticed picking up my neighbor’s litter. I’m sure those who see me running with empty water bottles think that they are mine. I ran home last Thursday with an empty beer bottle which I found in a yard on Boone Trace. No, it wasn’t mine. Maybe mama didn’t see the pacifier fall out of baby’s mouth. Maybe the dog took it out of the baby’s mouth. But now it’s trash, litter on the side of the road. It’s a tiny bit of litter, but if each person in the 1000 homes of the Boone Trace, Lexington Point and Riverwalk subdivisions leaves a tiny bit of trash behind. Well, you get the idea. Mama’s busy and overworked, but everyone should pick up after themselves. Teach your children to do so as well.